Jenell was at it again. 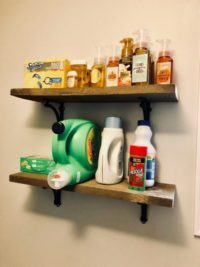 Watch as she transforms her laundry room shelf for under $20. Using some glass bottles from Ikea, labels from Staples and free printables she downloaded, Jenell was able to simplify and beautify her space.